1. Begin by reconstituting the soy curls. Add enough boiling water to cover and allow to sit for 10 minutes. Drain and set aside. 2. Meanwhile, in a large skillet over medium-high heat, heat 1 tbsp coconut oil. Once hot, add onion and a pinch of salt. Saute until translucent, around 5 minutes. 3. Stir in the reconstituted soy curls and cook until nicely browned, around 10 minutes. Push the onions and soy curls to the side so that you have room to quickly saute the garlic and ginger. Add the remainder 1 tsp of coconut oil and stir in the garlic and ginger, and stir, as it sizzles. After 15 seconds, stir it into the rest of the mixture. 4. Stir in the thyme, paprika, salt, allspice, Aleppo chile flakes, and cinnamon until well combined. 5. Add the tomatoes and cook for 10 minute more, stirring occasionally. Remove from heat, and stir in the maple syrup, lime juice and mustard. Season to taste. 6. While the main mixture doing its thing, you want to start the cooking the spinach. In a medium skillet over medium heat, heat the oil. Add the garlic and allow it to sizzle for a few seconds, being careful not to let it burn. Add the spinach and kale in batches, until it is all wilted and fits in the pan. Cook for 3 minutes. 7. Carefully remove any moisture that may have accumulated by pushing the green mixture to one side, holding in place with tongs and draining the water form the other side. Now return the greens to the stove on medium heat. Add the coconut milk, star anise and salt. Bring to a boil, stirring often, and cook for 5 minutes. Remove from heat and allow it to thicken. Remove star anise prior to serving. 8. 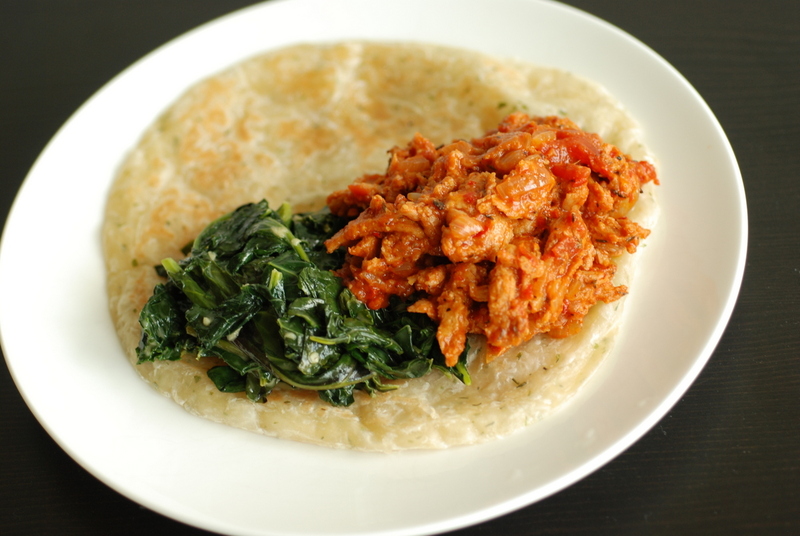 To serve, heat up your paratha/bun/etc, and fill with the sloppy joe mixture and creamed spinach. Yay, I hadn’t heard of TBC but now it’s on my food map. 🙂 Still haven’t had soy curls for some strange reason, they always look and sound amazing! The combination with creamed spinach/kale totally rocks. I love soy curls. They are so helpful for soaking up any sauce, or in casserole-type dishes. Definitely better after crisping in a skillet – if you just soak them and eat them, they are a little too sopngy. There’s no local source here either, but you can buy them online from VeganEssentials and through Amazon. How did I miss that Isa recipe?! Looks amazing. I was thrilled when I received a bag of soy curls in an international food swap- I think I made Asian dishes with them though if I remember correctly. Did you make those paratha? If so, do you have a recipe to share? Yummy!! For reference, the original Sloppy Joe’s that we had in Bend used tempeh as their protein base. Now I’m definitely going to have to find some soy curls here in NYC…I think the.boy would just about die of happiness if I made him a veg version of a sloppy joe! I had my first soy curls at this vegan-friendly Mexican joint in Portland, “Los Gorditos” and I loved them on these little sopas and tacos. However, they make me very bloated 😦 have you ever felt that way? 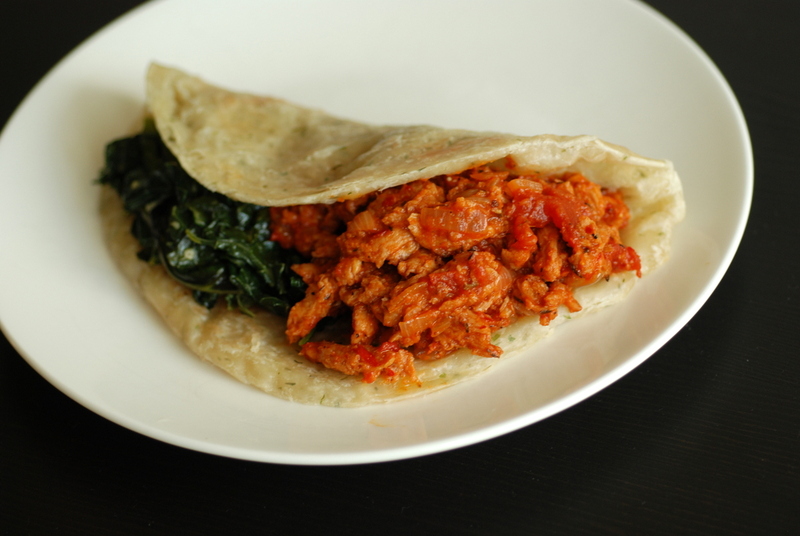 I would love to try this recipe with jackfruit, the carribean recipe sounds wonderful. Now I want to try soy curls really badly! 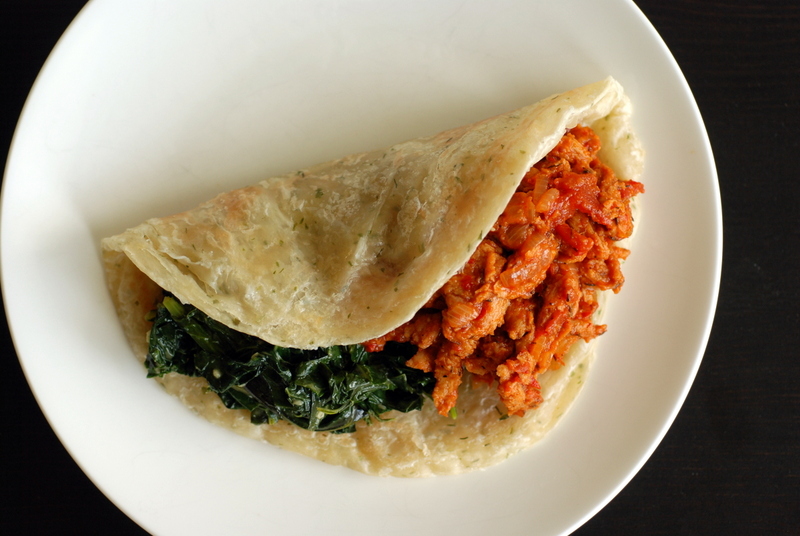 😉 This wrap looks amazing and I love it on the paratha–I almost always have them in my freezer. Those cream greens are mainly me drool too. Ahhh the soy curls! What are the chances that you can bring soy curls with you to Canada so that we can cook them and I can try them without buying a bag (thus being stuck with an ingredient that won’t agree with me)? 😉 They look so good! Loved this! Made it without a wrapper. So flavorful. Subbed collard greens for the spinach and kale since that’s what we had. can’t picture it with smashed chickpeas, as you said, but could with jackfruit. So happy that Amazon sells soy curls.